Bison. | Scuffalong: Genealogy. Bison. – Scuffalong: Genealogy. Arnetta L. Randall, Class of 1925. Arnetta was the second daughter and seventh child of George and Fannie Aldridge Randall. (Oscar and Fred Randall were among her brothers.) A teacher and lifelong resident of the District, she never married. Mable Margaret Williams, Class of 1933. Irvin LeFetus McCaine, Class of 1934. 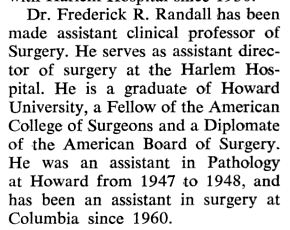 Frederick Russell Randall, Class of 1942. RANDALL–Frederick R., MD. 91. Former Surgeon and Professor of Surgery at Columbia-Presbyterian Medical Center. He had compassion for his patients; and wisdom for his students. A devoted husband and loving father, he leaves Elizabeth [W. Glover], his wife of over 68 years and his sons, Derek and John. A bereaved family is consoled by cherished memories. What be it worth the life of a man, but that which he himself has given to it? This strong man gave much. Published in The New York Times on Apr. 6, 2014. → In memoriam: Louise Daniel Hutchinson. Pingback: Cousin Mable meets Marian Anderson. | Scuffalong: Genealogy.